There is a growing movement in senior housing centers and retirement homes to increase animal/patient interactions for health and wellness benefits. This means not only bringing in live pets to visit, but also giving senior patients a stuffed cat, dog, or other animal to hold and keep. 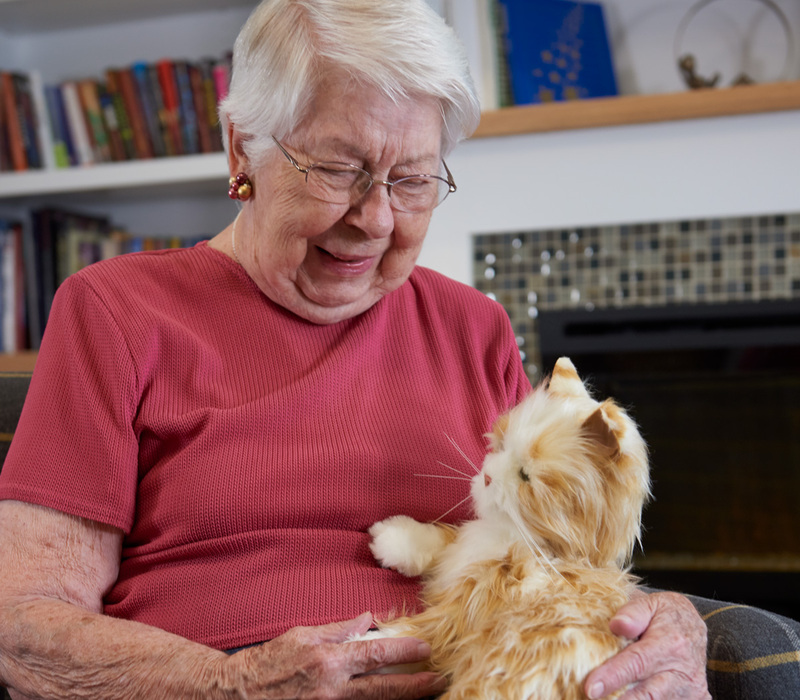 Pet therapy for seniors, also known as Animal Assisted Therapy, is a technique that uses animals to interact with seniors for numerous reasons to help improve their quality of life. Studies show that just 15 minutes spent bonding with an animal, real or stuffed, promotes hormonal changes within the brain. Research suggests that creating positive emotional experiences for Alzheimer’s and dementia patients diminish distress and behavior problems. People with mid- to late stages of Alzheimer’s continue to feel deep emotion, even though memory, language, and cognitive function steadily have declined. Holding a stuffed pet brings deep emotion to the surface, creating a calming, familiar feeling. The patient does not feel alone. 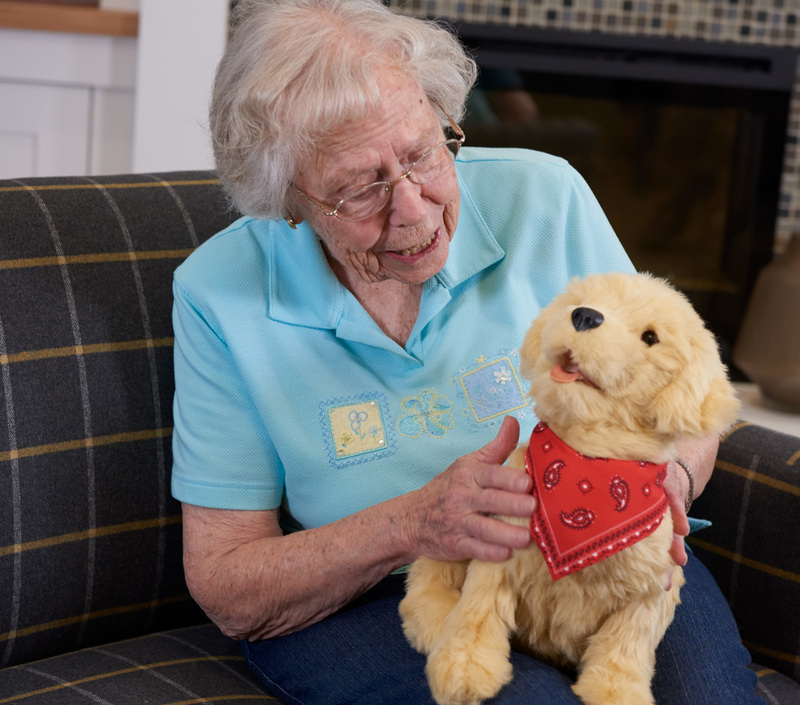 One study completed in 2007 found that pet therapy could be used to increase positive behaviors in users, with researchers concluding that stuffed animal therapy is an effective approach in caring for seniors with Alzheimer’s or dementia. distract and calm someone who is upset. provide endless hours of hugs and smiles. remind seniors of previous love of their own pets. regenerate warm, nurturing feelings of caring for another. make it possible for someone who is totally dependent on others to care for someone else. 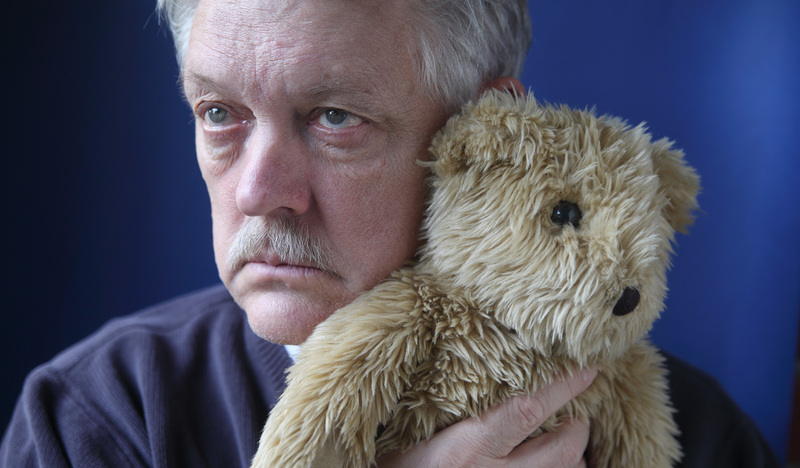 Stuffed pet therapy animals are safer than real dogs and cats. You don’t have to worry about the safety of animals, patients, or visitors. They don’t have to be walked or fed or cleaned up after. They do not irritate allergies, or cut and bleed. There are those, though, who say it is demeaning and beneath the dignity of the person. That is a case-by-case situation between the patient, the doctors, and the family. 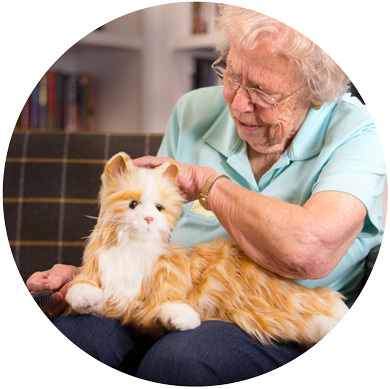 Studies show that most patients become attached to their stuffed pet, becoming more interactive and social with the pet and those around them. They have something to talk to when alone in their room, and something to hug and cuddle, which brings a sense of relaxation to the senior. If you are thinking of buying a stuffed pet, there are a number of options. Besides the ordinary stuffed teddy bear, dog, or lion, there are pups and cats that have built-in sensors to respond to motion and touch, or therapeutic weighted baby dolls. Nasco carries both and so much more for seniors and dementia/Alzheimer’s patients. Don’t be afraid to buy your senior a stuffed cat to cuddle. The patient deserves to feel good about taking care of something soft and cuddly. It doesn’t matter that it’s stuffed – it’s the stimulation of the heart and memory that is important.